From time to time, everyone likes to see the bigger picture, right? Whether you’re an avid gamer, who wants to be closer to his virtual worlds, a movie geek who doesn’t want to miss any detail of the plot or you’re addressing the crowd through engaging presentations, the best solution for you is definitely a projector. However, there are so many to choose from and you want what’s best for your free time or for your audience. 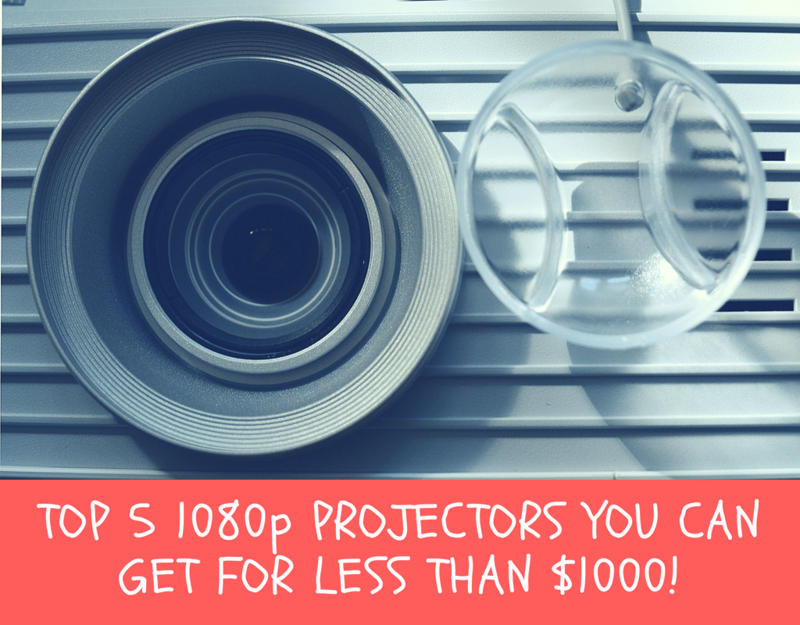 So, we thought that a short presentation of the best 1080p projectors under $1000 might come useful for you. Why 1080p projectors? Because these machines are essential when it comes to enjoying the high definition quality. We’re talking about an image that’s 1920 pixels across and 1080 pixels down – which indeed gives you the chance to enjoy the bigger picture! Even if, in time, many other technologies have been developed, these 1080p projectors seem to remain efficient and are still used in college classrooms, scientific and engineering applications, as the quality of their image is still great and provides a very good resolution. What is more, 1080p projectors are the first choice when it comes to home theatres, managing to reach most people’s expectations and provide lifelike experiences for them in their own homes. 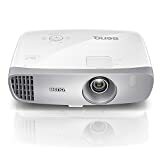 Therefore, the age of 1080 is not fading, and they still remain popular especially because they are affordable and they seem to offer a great price-quality ratio for those interested in purchasing a projector. I would rather invest in a top-of-the-range 1080p projector than a bottom end 4k projector for sure. First on our list is Benq’s latest offering in the 1080p projector world, designed to offer lifelike experienced for its viewers. This projector works on a DLP technology and is enriched with a DLP high resolution. Add to this its color brightness of 2,200 Lumens and a fast RGBRGB color wheel and you will be sure to brighten your every day. When it comes to the dark side, the 15000:1 contrast and the ISF calibration for day and night viewing make every detail be noticed by you. For the gamers out there, this one might be in your top of best projectors under $1000, as well, as it comes with a low input lag of 16 ms and 20 keystones for projection. And this is not all! It includes glass lenses, anamorphic stretch, quiet operation, and vertical lens shift. What is more, you can use it in smaller rooms due to its minimum throw of 1.15 and a zoom lens of 1.3. Sounds great, doesn’t it? Frankly, we’re convinced it is the best option for everyone, as it manages to convey a high-quality picture, surprisingly loud speakers of 10W and great compatibility accompanied by connectivity easy to set. This Optoma projector is a fairly small, but chic one. Working on DLP technology as well, it puts a fair amount of brightness of 3200 ANSI Lumens, as well as amazing colors and a nice contrast of 25000:1. These characteristics allow it to produce a highly saturated image for you to watch everything you like – from sports events to engaging movies and important presentations. With this projector, you are able to adjust the picture, according to six picture modes (Bright, Vivid, Game, Cinema, Reference, and User) and you can also preset the color temperature. It really fits your needs, whether you want to watch HDTV, Blu-Ray or DVD content and it’s also an affordable solution. And for the pictures to be accompanied successfully by a clear, engaging sound, this projector displays a good audio quality – even though it does not provide a very loud sound. 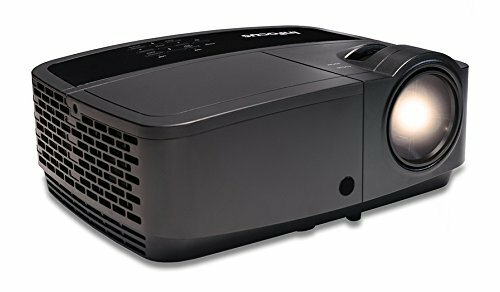 Efficient, clear and made to take everyone’s eyes, this projector is definitely a good choice for a home cinema or for offering successful presentations for smaller crowds. As part of Epson’s 2017 new value line, this is a home entertainment projector that works on a 3LCD technology. It displays a brightness of 3,100 Color and White Lumens, which makes every picture look brighter than on any screen and handles the natural or ambient light in your room very well. What you should keep in mind about the room you are about to transform into a home cinema theatre is that it shouldn’t be very spacious: when it comes to the sound, quiet seems to be the word describing this projector. As a result, its 2-watt mono speakers make it perfect for small rooms. You’ll be pleased to find out that this Epson Home Cinema 1060 projector is able to boast streaming as a special feature, therefore whatever streaming devices you own, be ready to enjoy them at a larger scale. You’ll also be able to enjoy playing on your Xbox or Play Station as much as you want – with a great lamp life of 10,000 hours at full power and 6,000 in ECO Mode. With an easy set-up, this projector aims at giving the avid gamers nice experiences in terms of video and sound, as well as addressing small crowds by giving them the chance to witness powerful presentations. This is definitely among the best 1080p projectors under $1000 you’ll ever find. So, if it fits your needs, just go for it! Designed for business presentations on the go and not only, this projector from InFocus promises to make your life easier and is definitely among the best 1080p projectors under $1000 that you want to be aware of. Not only is it priced right, but it is also enriched with a long-life lamp that will display your HD content without any filters. It comes with a great HD resolution, and it has a great brightness of 3,200 Lumens designed to make every picture look great, especially because the contrast ratio of 15,000:1 delivers bright whites and darker blacks. Thanks to these features, along with its 16,7 million colors, this projector makes every content engaging for its audience. When it comes to the sound, it is supplemented with built-in speakers and a 3,55 mm audio port, able to provide clear messages. It really does let you reach to your public with its true-to-life colors and DLP technology, clear audio, and good brightness, don’t you agree? Finally, this is not only efficient and easy to set-up, but it also has a practical size and weight – offering you the chance to prepare and host nice events. 1080P HD RESOLUTION: Watch your favorite movies, sports, and games as they were meant to be seen, in full native 1080p resolution (16:9 aspect ratio). With no scaling or altering of the image, your picture will look better than ever and larger than life - at an affordable price. HDMI CEC COMPATIBLE: The IN119HDxa is an HDMI Consumer Electronics Control (CEC) compatible device, so you can control it, and up to 14 other HDMI CEC compatible devices, with one remote. ADVANCED 3D SUPPORT: Powered by the latest DLP technology, the IN119HDxa displays stunning 3D content from PCs, Xbox, PlayStation, Blu-ray, and many other sources. Just add 144Hz DLP Link 3D glasses (sold separately) to seamlessly synchronize with the image for an awesome 3D experience. Another projector designed to make every business presentation clear and engaging is this one, designed by BenQ. Made to work well with well-lit rooms, it aims at displaying comfortable presentations for up to 10 participants. It provides pictures with vibrant colors and a brightness of 3,500 lumens, which makes every detail be noticed by your audience. The texts of your presentation or the subtitles are highlighted by this projector’s high fill factor, which also reduces eye strain for presenters and the public. BenQ MH535A is also supplemented with a contrast of 15,000:1, which ensures crisp readability that will for sure help you convey any message to your audience. It might not have the most powerful sound or provide very large pictures, but it is efficient when it comes to set-up connections, the impact that the text will have on your audience and the quality of the pictures, which are indisputably great! These being said, we declare ourselves convinced. For great business presentations, this is definitely worthy of purchase! With so many options out there on the market, you might sometimes feel overwhelmed by all the specifications and functions that each projector has. However, when choosing the best 1080p projector, you should think about your needs. Do you want this projector as your own home cinema? Do you want to use it to play games? Do you need to make powerful presentations for an audience? According to these, you might take into account some important aspects in order to choose the right one for you. We’ll offer you a short guide that will hopefully prove helpful when choosing the best 1080p projector under $1000. 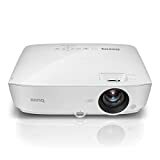 In case you need it for your own pleasure, you might want to choose a projector that is really easy to set-up and has great connectivity. You might want to take into account the color accuracy, the brightness, and contrast that your projector provides. Usually, these 1080p projectors come with a good quality of the picture, as you could see above. Our five suggestions are all able to provide lifelike experiences and pictures, with their contrast of 15:000:1 or even more, along with the efficient and smart technologies they work on, such as 3LCD. Another aspect you should keep in mind is connectivity. Whether you want to watch movies and videos, play games or simply use the projector as a screen, you will need to connect it to different devices. A good projector offers multiplatform digital connectivity, such as HDMI and can be connected to anything you want easily and efficiently! For those who need a projector for business purposes, the factors differ a bit. You’ve read our suggestions for the best 1080p projectors under $1000 and you have seen that most of them were designed to provide powerful messages and pictures in order for your job to be well done. This is why you should be aware of the quality of the picture that a projector provides and also of the sound system, which might not be able to reach to everyone’s ears. 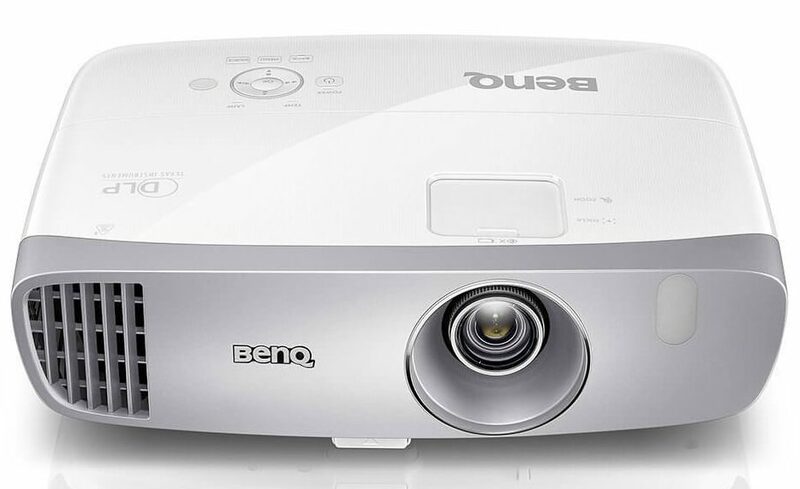 Projectors such as InFocus IN118HDxc and BenQ MH535A are designed for efficient business presentations but might go well only with small groups of people, as they aim at emphasizing the most important messages in a presentation, such as a subtitle, the written texts and the details of the pictures. Also, as stated above, pay attention to the connectivity of the projector and to its compatibility with other devices, and this way, you make sure you’re all set for a great meeting! 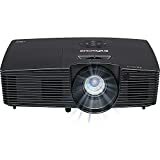 As you’ve seen above, in our top 5 1080p projectors under $1000, you have a good range of products to choose from. They’re all designed for your needs and they make sure that each of the pictures they show is worth 1000 words. We agree on the quality of 1080p projectors and we definitely think they are right for everyone who wants or needs a larger screen to please their eyes. Depending on the brand and on the features that each projector is enriched with, there are plenty of choices waiting for you. Since there are a lot of variables to be taken into account when choosing the best projector for you, the choice is quite difficult – but not impossible to take! For us, the BenQ HT2050A 1080p projector proved to be a perfect choice, even if each of the suggestions above is built to fit different needs and tastes. Hopefully, this review of the best 1080p projectors proved useful for you, even if the final decision belongs to you. Check the specifications again, see if they meet your expectations and prepare to lean back and relax while watching amazing pictures – the 1080p projectors are ready to offer you unforgettable experiences for an accessible price. Great blog! just one thing, it is a generation that prefers 4k resolution and in a few years, we will be having 4k at 144hz. And at projectors prices for 4k projectors are really high, do you think prices will go down in a couple of years? I will answer your last question first. The price of 4K projectors has dropped significantly in the last few years, so I’m not anticipating further dramatic changes to the price. However, I think there’s a chance the current products will become cheaper over time. To your point about living in a generation that prefers 4k resolution… While many would say that is true, there isn’t a 4K projector at this time that goes for under $1000. At the end of the day, people need to go with the best options available within their budget.